It is only on rare occasions one is afforded the opportunity to experience a film that speaks to the very depths of the human experience; a film that has the emotional and philosophical capacity to communicate, on a universal level, something of what it means to exist; a film that is truly, in every sense, profound. Watching Alfonso Cuarón's Roma is most definitely one of these occasions. The profundity of Roma stems from Cuarón's humanist tendencies as a filmmaker; here, he is concerned with authentically portraying a woman experiencing ordinary life and what that means, as he searches for the meaning of his own existence. Taking place between 1970 and 1971 in the residential district of Roma in Mexico City, where Cuarón grew up, it is the director’s most personal film to date. Based on the real-life story of Libo, the woman who helped raised him and to whom the film is dedicated, Cuarón allows us to witness intimate recollections of his memories of this period through the eyes of Cleo (exquisitely played by Yalitza Aparicio, making her film debut). As the opening credits roll, we watch water slowly creep over tiles on the ground, and immediately become silent observers of a woman going about her daily routine. From the very beginning, Cuarón immerses us into the world that Cleo inhabits, which is also the world of his past. The first half of the film meanders slowly as we come to know Cleo and the family for which she works. We watch her develop and nurture relationships with her best friend, Adela (Nancy García García), the mother of the children she looks after, Sophia (Marina de Tavira), and the children themselves — especially the youngest, who relays to her how he died in his past-lives. We watch as she washes clothing and cleans the house, and meets a man, and we soon realise that by the time anything significant happens plot-wise we are completely, emotionally invested in Cleo and the rest of the family because we know them. We have shared their domestic space and have been privy to their most intimate moments, and we feel deeply connected to them because of it. It is this connection - this closeness - that creates compassion and empathy for others, and it is an essential part of what makes us human. No matter who we are or where we’ve come from, this is something that all human beings understand. 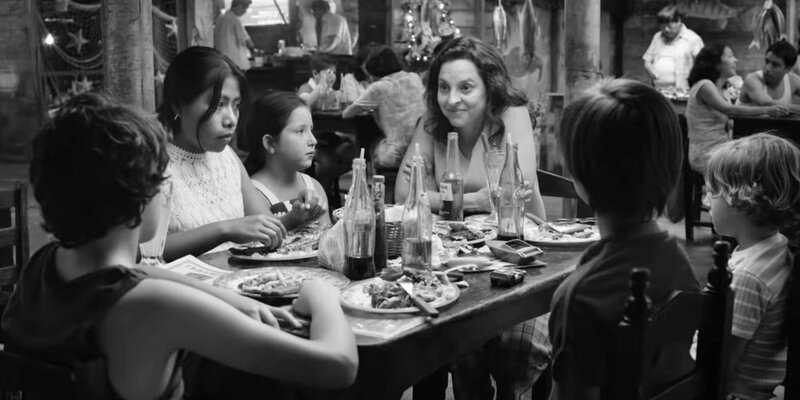 There is also an element of socio-political upheaval as a backdrop to this intimate family drama that Cuarón is highlighting; it was an era of Mexican history rife with socio-economic, class and gender disparities, not too dissimilar to the current realities of today’s world. But what is important is that all of this is contextualised through Cleo’s experience, as an indigenous woman from a poor socio-economic background, and how it comes to impact her life in various ways. In many ways, the context in which she finds herself facilitated the situation in which she comes to love and care for this family, and how they come to love and care for her. In a world where much is out of our control, finding meaning in life comes from these connections we share with others and the universal empathy this generates. Roma plays on Curzon screens now.